For full-stack monitoring of OpenShift clusters, you need to roll-out Dynatrace OneAgent on each cluster node using OneAgent Operator for OpenShift 3.9 or higher. For OpenShift 3.7 or lower, you need to deploy the DaemonSet. OneAgent Operator v0.3.0 requires OpenShift 3.11 or higher. Older versions of the OneAgent Operator work with OpenShift v3.9 or higher. The OneAgent Operator requires two different tokens for interacting with Dynatrace servers. These two tokens are made available to OneAgent Operator by means of a Kubernetes secret as explained at a later step. Create the necessary objects for OneAgent Operator. OneAgent Operator acts on its separate project dynatrace. It holds the operator deployment and all dependent objects like permissions, custom resources and the corresponding DaemonSet. You can also observe the logs of OneAgent Operator. $ oc -n dynatrace create secret generic oneagent --from-literal="apiToken=API_TOKEN" --from-literal="paasToken=PAAS_TOKEN"
Provide the image pull secret in case you set .spec.image to registry.connect.redhat.com/dynatrace/oneagent. Download or copy the dynatrace-oneagent-template.yml OpenShift template. description: Installs Dynatrace OneAgent for all-in-one, full-stack monitoring of OpenShift with Dynatrace. Requires privileged access. 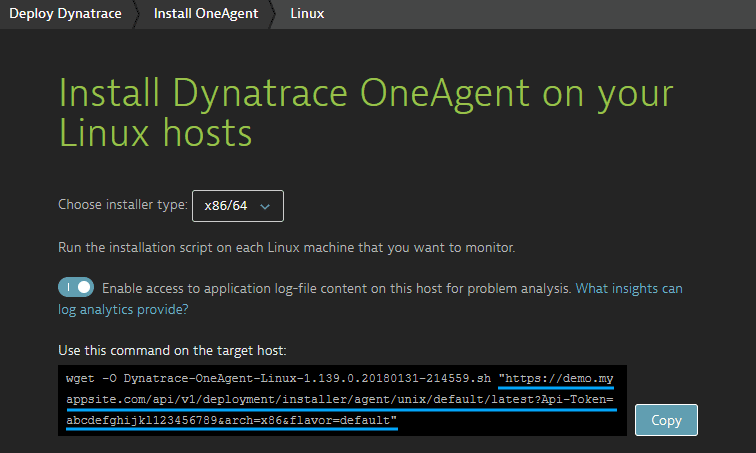 description: "A URL that points to your cluster&apos;s OneAgent download location (Select \"Deploy Dynatrace\" from the Dynatrace navigation menu to access your URL). Example: https://EnvironmentID.live.dynatrace.com/installer/oneagent/unix/latest/AbCdEfGhIjKlMnOp." description: "Must be true if the SSL certificate check upon OneAgent download will be omitted, otherwise false (default). If you&apos;re using a Dynatrace Managed cluster with a self-signed certificate, set this to true." Run the installer script. Replace [oneagent-installer-script-url] with your actual OneAgent installer script URL. Be sure to enclose the URL with quotation marks. Otherwise the URL will break the commands. For OpenShift versions 3.7 and higher, the Red Hat Connect Partner Registry may not accept the auto-generated dockercfg secret type (because of BZ#1476330). Therefore, you must create a generic file-based secret using the generated file from a docker login command.